On the 25th June 2015 we held our second ‘Dial a Director’ day and it was again, a success. Over the next couple of weeks we will be considering the points raised and I will provide an update to the specific individuals who contributed on the day. We would like to continue with this additional communication opportunity as your views and thoughts are important. 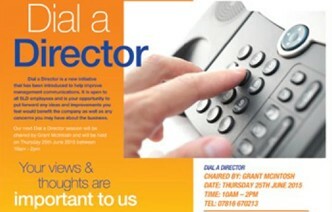 Our next ‘Dial a Director’ call will take place in September (date to be confirmed) and will be hosted by Neil Lewis. I would encourage you to call in even if to reinforce a positive initiative in the business.